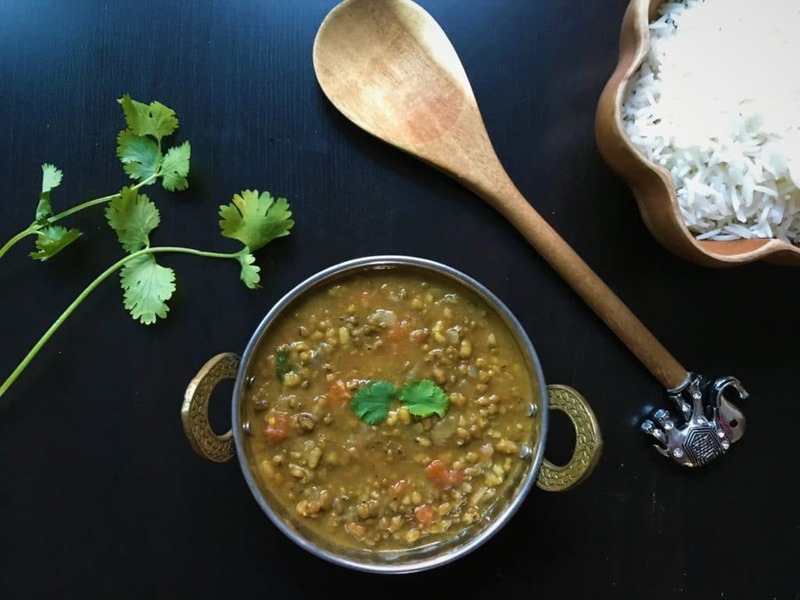 Wholesome Green Moong Dal made in an Instant Pot or a Stovetop Pressure Cooker. This is a delicious creamy lentil soup, that is so easy and quick to make in a pressure cooker. 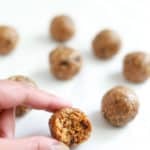 Very nutritious with lots of protein and perfect for a cold evening. This is a North Indian style recipe for green moong dal, also known as sabut moong dal. Growing up this used to be made almost every week for dinner. We always had a veggie curry and a lentil or legume, along with roti (Indian flatbread) for dinner. Some days we would have rice, but not every day. This is a very typical north indian dinner. 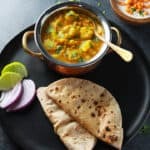 If you don’t have green moong dal in your pantry, check out other popular North Indian lentil soups – Chana Dal, Moong Dal Fry. 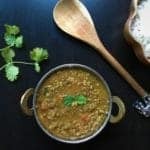 How to make Green Moong Lentils in Pressure Cooker? I do not soak these lentils. You can if you have planned well, and reduce the cooking time to 10 minutes. I usually don’t plan much for lentils, as I know that I can easily and quickly cook them in the pressure cooker. Follow the same process as in the video when cooking on a stovetop pressure cooker. Cook on high flame for 2 whistles and then change to medium-low flame and let it cook for another 8 minutes. If you plan to enjoy this as a soup, you can add veggies like carrot, sweet potato to celery along with the lentils before you pressure cook. Stir spinach or kale at the end to make this a hearty vegetable lentil soup. 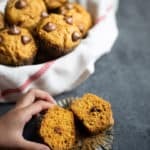 You can also double this recipe with the same cooking time. The pressure cooker will just take longer to come to pressure. This lentil also freezes well, so it is great for meal prep. Enjoy this easy and delicious lentil soup. 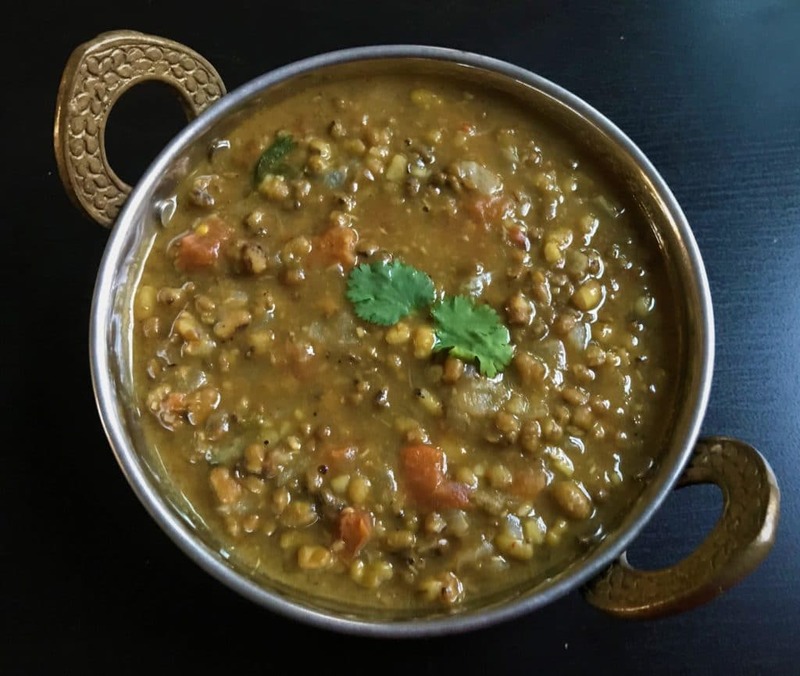 Wholesome Green Moong lentils simmered in onion-tomato gravy made in Instant Pot. A protein rich dish, enjoy as a lentil soup along with a side of rice. Start the instant pot in SAUTE mode and heat oil in it. Add cumin seeds, green chili and saute for 30 seconds. Add onions, ginger and garlic. Saute for 1 minute. Add chopped tomato, spices and stir. Add lentils and water. Stir well. Press CANCEL and close the instant pot lid with vent in sealing position. Press MANUAL or Pressure Cook mode for 15 minutes. When the instant pot beeps, let the pressure release naturally (NPR). Open the lid and add lime juice and cilantro. Stir and green moong dal is ready to be served. Heat oil in the pressure cooker on medium-high flame. Add cumin seeds, green chili and saute for 30 seconds. Add onions, ginger and garlic. Saute for 3 minute. Add lentils and water. Stir well. Cover the lid, turn the heat on high flame and pressure cook it until your hear two whistles. Now reduce the flame to medium and pressure cook it for another 8 minutes. Let the pressure release naturally. 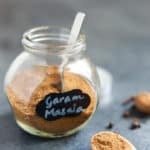 To reduce spice, skip the green chili and reduce garam masala to 1/2 tsp. 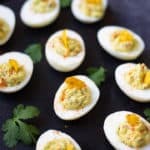 This recipe can be doubled with no change in cooking time. I accidentally doubled the tomatoes, so I added extra ginger and garlic. The flavors are wonderful. Hi Molly – Glad to hear you enjoyed the dal! Loved it. Taste so similar to my mom ‘s home cooked mung dal. Super easy since no soaking was required. Thank you. Hey Beanz – Glad you enjoyed the dal. This is how my mom makes it too, and we always enjoy it!